Click here to pay the registration fee and obtain your Viva3D Pro download. All software has a 5-year support guarantee, extendable to 10-years. License terms: Please click here to view the license terms before purchasing; license PDF. Viva3D Designer Standard (Student) allows you to rapidly create 3D content for presentations, digital signage, videos, images and web banners, in any resolution up to FHD 1080, with quality TV studio-type effects, including lighting, shadows, surface reflections, glass and a range of special materials. Database connection and autostereoscopic output is not included; see DS/DSPA version. Features high-definition camera and video, with chroma-keying to allow you to appear in your own 3D scenes and 2D videos. 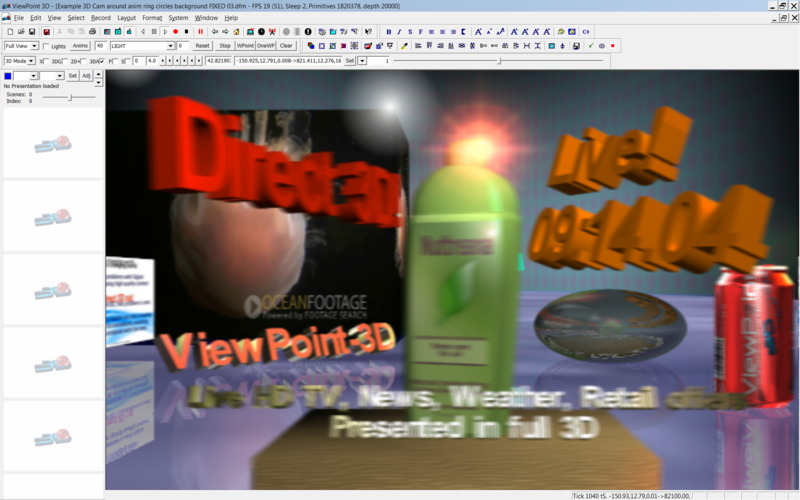 Using a WYSIWYG user interface, creating 3D content is now as simple as using any well-known 2D presentation software. Viva3D DS (Business) is the fully-featured Digital Signage version, offering a comprehensive range of data processing and reporting facilities, allowing database and RSS feeds to drive the 3D content in real-time, allowing, for example, timetable and price changes to instantly update, or a 3D weather fly-through to have 3D weather symbols that reflect the weather at the moment, or an airport's real-time flight information screen, keeping content always fresh. Combined with the latest ePC media computer, a small-format full-HD screen controller, a complete digital signage package can be rapidly deployed with 24x7 reliability. Viva3D DSPA (Corporate) Digital Signage Professional version working up to QHD and 8K, offering advanced 3D presentation with live-data, content creation and management with near-reality quality, extended support, and direct output for 3D glasses-free monitors and projectors. Viewpoint 3D DSP encodes output for Declipse 2D + Depth (WOWvx) and Autostereoscopic 3D glasses-free monitors, to produce data-controlled 2D and 3D presentations, as used in retail, airports, and other sectors. Full support and introductory training via Skype is included for 12 months. *** Includes personalised technical support. Viva3D Player DS is a complete digital signage software solution for embedded PC screen controllers, and works with all standard 2D screens and projectors. Reporting, including configurable email and SMS message sending, is also included ensuring that your screen network's status is known 24 hours a day. Player DS has automated data updating from one of two user-defined FTP sites, providing a simple and efficient system for distributing your data to very large networks of screens. Viva3D Player DSPA works both with standard 2D screens and projectors, and the latest 3D WOWvx and Autostereoscopic screens, and 3D projectors. Viva3D Network Monitor and Data Server the complete digital signage network supervision server software, provides comprehensive status reporting and other facilities. Details and pricing on request. You can obtain support provided by one of our experts to help you get your project up and running quickly and painlessly! Basic support provides a technician to help you set-up the software and learn how to use it for your project. Standard support provides a higher-level of knowledge to support more complex projects. Advanced provides the highest-level of support up to specialized function additions. The latest 3D ePC media computers are perfect for all digital signage applications, powerful and low-energy (from 10W) ideal for studio quality 3D presentations, or sophisticated public information screens at airports using animated 2D, 3D and mixed content. The ePC is available with Embedded Linux* or Windows, a 64 GB solid-state hard-drive, 2 - 4GB RAM and full 3D QHD video support with integrated GPU, making the ePC the perfect choice for all digital signage and presentation tasks requiring high quality, 24x7 operation, and comprehensive facilities. Several models are available, including a pocket-sized ePC-Stick with full facilities, a low-power model with latest generation graphics, supporting 4K playback and 3D graphics, to a powerful yet compact 3D model using the latest AMD A4 APU, and a high power unit based on AMD latest Advanced Processor Units. To order the ePC Stick please contact us. With preinstalled ViewPoint 3D software, the ePC provides a complete and ready-to-go solution. See the latest Brochure Page down for more details. The ePC 3D range offer the very latest innovation for embedded 24x7 applications with very low energy consumption. The DS mini system can drive up to 4K monitors, and runs exceptionally cool, consumming just 18 watts standard for Digital Signage multimedia applications. Low power means long-life and low electric bills. The CD-sized aluminium case with advanced air cooling guarantees 24x7 operation. Low-power12V DC or 110/220 VAC operation makes the DS mini ideal for a wide range of applications, from fixed to vehicle-based digital signage. 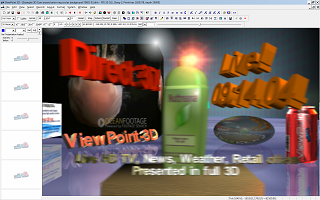 The DS 3D model is a complete multimedia computer system, remote control, and support for up to 3 external monitors or TVs with independent content. Its attractive case is ideal for the modern office or home. The DSP 3D model is a breakthrough in minaturized supercomputing, and is able to drive 3 independent monitors in FHD mode, including with live 3D content, with high frame rates for the most stunning 3D. Powered by AMD's latest generation graphics processor, it provides supercomputer performance, and is 3 times faster than the Intel i7+HD4000 processor, all this combined with the award winning solid-state SATA III drive and ViewPoint 3D DSP software. © 2010-2018 ViewPoint 3D Ltd. All Rights Reserved.